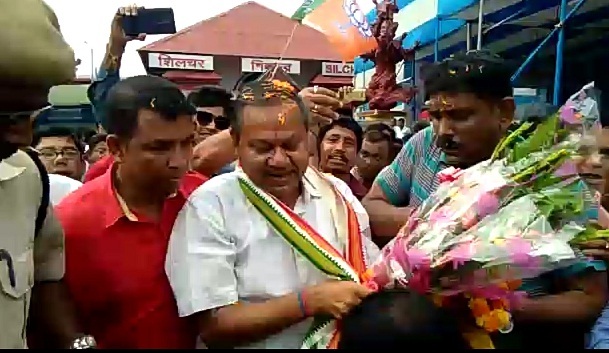 Former Deputy Speaker of Assam Assembly Dilip Paul was accorded a hero’s welcome when he reached Silchar on Friday. Paul, a two-time BJP MLA from Silchar, relinquished the post of Deputy Speaker on May 8. His sacrifice made the people of Barak Valley proud and his popularity has increased in his home town Silchar. This was evident when he reached Silchar by train on Friday afternoon. Paul’s admirers and supporters took out a huge bike rally from Silchar railway station to BJP office shouting slogans like “Dilip Paul zindabad”. 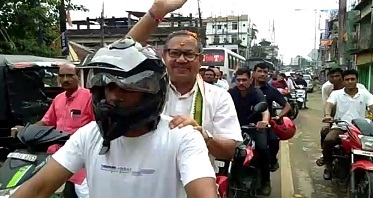 Bike rally with Dilip Paul passing through the streets of Silchar on Friday. BJP workers received him at the party office in Silchar and organized a reception meeting there. Former district president Uday Shankar Goswami, senior leader Ramakrishna Sinha and others were present in the meeting. Addressing the reception meeting, Dilip Paul said he is feeling free after resigning as the Deputy Speaker. He said he can now do something ‘fruitful’ for his constituency. He said with confidence that the Citizenship Amendment Bill will definitely be passed and no force can resist it. Paul also expressed disappointment on the removal of Uday Shankar Goswami as district BJP president. The Silchar legislator paid his tribute to the Bhasha Shahid memorial at the Silchar railway station premises. In the letter to the Chief Minister Sarbananda Sonowal, a copy of which is available with Northeast Now, Paul stated ‘he is not feeling comfortable in the post’. Paul also reminded Chief Minister in the letter that he had requested him on August 8 last year to release him from his responsibility. He had also sent a letter to DGP Kuladhar Saikia asking him to withdraw all his government security personnel, PSOs, drivers and house guards as he has resigned from the post of Deputy Speaker.